Initial assessments of 48 shale gas basins in 32 countries suggest that shale gas resources, which have recently provided a major boost to U.S. natural gas production, are also available in other world regions. A new EIA-sponsored study reported initial assessments of 5,760 trillion cubic feet (Tcf) of technically recoverable shale gas resources in 32 foreign countries, compared with 862 Tcf in the United States. In 2010, U.S. shale gas production reached 4.87 Tcf (23 percent of total U.S. natural gas production), compared with 0.39 Tcf in 2000. This shows both the rapid growth and absolute importance of the shale gas resource to the United States. Rising production from shale gas resources has been credited with both lower natural gas prices and declining dependence on imported natural gas. As is often the case with resource development, shale gas production also has raised local environmental concerns, largely centering on the amount of water used in the fracturing process and the need to handle, recycle, and treat fracturing fluids in a manner that addresses the risk of spills that can potentially affect water quality. EIA's Annual Energy Outlook 2011 Reference case also reflects the growing importance of U.S. shale gas. It projects that shale gas will account for about 46 percent of U.S. natural gas production in 2035. Do other countries have similar opportunities to develop shale gas? To begin to address that question, EIA sponsored Advanced Resources International, Inc., to assess 48 gas shale basins in 32 countries, containing almost 70 shale gas formations. This effort has culminated in the report: World Shale Gas Resources: An Initial Assessment of 14 Regions Outside the United States. Technically recoverable natural gas resources in the assessed basins totaled 5,760 Tcf. Adding the estimated U.S. shale gas technically recoverable resources (862 Tcf) to the assessments in the study gives a total of 6,622 Tcf. For comparison, most current estimates of world technically recoverable natural gas resources include few if any of the resources assessed in this study and total about 16,000 Tcf. Thus, adding the identified shale gas resources to other gas resources increases total world technically recoverable resources by over 40 percent to over 22,000 Tcf. Nations outside the 32 countries studied. These include Russia and the Middle East, which have very large resources of conventional gas. 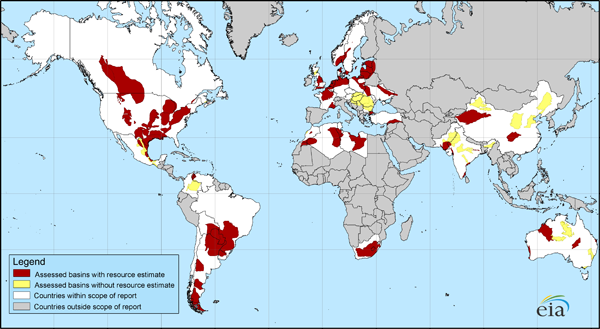 Some shale basins in the countries studied. In many cases, no estimates are possible yet for these basins. Of the countries covered in the EIA-sponsored study, two groups may find shale gas development most attractive. The first is those countries that currently depend heavily on natural gas imports but that also have significant shale gas resources. These include France, Poland, Turkey, Ukraine, South Africa, Morocco, and Chile. The second group is those countries that already produce substantial amounts of natural gas and also have large shale resources. In addition to the United States, this group includes Canada, Mexico, China, Australia, Libya, Algeria, Argentina, and Brazil.